Land & Freedom enjoys a good or even excellent reputation among radicals. The purpose of this piece is not to challenge that reputation from a film critic’s point of view: it is politics and theory we will be dealing with. This is not about aesthetics either. Some will favour ambiguity in art, stay away from novels with a message, and believe that it is with noble sentiments that bad literature gets written (and probably bad theory too). Others may despise “art for art’s sake”, and prefer fiction that relates to social issues and does not mind making points. We will not go into that. This is only about Land & Freedom, not about Ken Loach’s films in general or his politics. First, a short summary for those who may not have seen the film (released in 1995). Nearly all of the narrative is a flashback. A young woman today discovers the past of her recently deceased grand-father, David. In the late 30’s, David, a young worker, and a member of the CP, goes to fight in Spain against Franco. Though he first intended to join the International Brigades, he finds himself in a poorly-equipped POUM militia on the Aragon front, alongside volunteers from all over Europe, men and women. One of them is Blanca, an ardent and able defender of the POUM. David is attracted to her. When he is wounded, David goes to Barcelona, where he joins the International Brigades. In May 1937, when the republican State backed by the Stalinists finally regains control of the town and gets rid of radical elements, David first sides with government forces, until eventually he tears up his party card and goes back to his old company. The POUM militia, however, is in dire straits. The International Brigades first deny it any real military support, then force it to disband (the POUM had been banned as an agent of fascism). In the skirmish, Blanca is shot dead. Back to the present in England. David’s funeral is attended by former Spanish war fighters. The film ends on a raised fist salute. As shown by this summary, the film deals with major historical events hardly ever seen on the screen. For instance, Sam Wood’s For Whom the Bell Tolls, made in 1943 when Russia and America were jointly fighting Hitler, presented the anti-fascist camp as a united front, in accordance with Hemingway’s novel that inspired the film. Land & Freedom’s subject matter is obviously rarely dealt with in movies. The trouble is, instead of fostering critical thinking on these events, it narrates them in a way that forces conclusions upon us as if they were self-evident, and finally evades the political issue. This is not to say that there is no political debate in the film. The exact opposite. One of the longest scenes (12 minutes), and the most important one according to Ken Loach himself, describes a discussion on collectivization in a village liberated by the POUM militia. Should collectivization take place immediately or not ? An American argues that the war against Franco must have priority, and advises the villagers not to take radical measures that would alienate capitalist democracies which otherwise would support the Republic in its anti-fascist military effort. In contrast, a German volunteer maintains that war and revolution must go hand in hand. The meeting eventually votes in favour of collectivization. This scene is clearly at the crux of the matter. Watching a film, however, is different from reading about and choosing between political options in print. The viewer faces a screen :characters act in a succession of scenes, and the way each scene becomes meaningful depends on what the viewer has been shown before and will be shown afterwards. In this case, the meeting on “war v. revolution”, or “war plus revolution”, makes sense only in relation with the whole of the plot, and especially with the climactic scene when the conflict between the militia and the regular army erupts into violence and bloodshed. Indeed, the opposition between these two groups is central to the film: therefore the impression and the memory we are left with derive from the way they are portrayed. On the other side, the official, now “professional” republican army is depicted as a mass of brutal undifferentiated uniforms. Among its officers, the American we have seen arguing against collectivization. As the whole drama is seen (and narrated) through the eyes of an obviously nice guy, we are drawn to identify with one group (the one this guy belongs to) against the other: a little because of what these groups stand for, and a lot because of what they look like. Let’s imagine an anti-Trotskyist Russian film made in the late 30’s (Stalinists denounced the POUM as Trotskyist, which it was not: Trotsky was highly critical of the POUM’s involvement in the Popular Front). We would be shown on one side an International Brigades’ platoon where socialists, communists and democrats would fight as brothers. We would become familiar with three or four of them, from different countries, with various backgrounds and different personalities, preferably with minor disagreements to be solved near the end. We would see them fighting, cooking, having fun, decent and articulate people. On the opposite side, we would be presented with a wild gun-wielding bunch, incapable of coherent political talk. If the script-writer cared for characterization, he would show us one of them getting drunk, another playing with the watch stolen from a bourgeois, a third one running away with a wad of cash. According to the same logic as Land & Freedom, only in an inverted way, the story would be told via the memory of a young naïve worker. At the beginning, he would have anarchist leanings but, as the plot unfolds, the scales would gradually drop from his eyes and he would end up a friend of comrade Stalin. In a nutshell, the first group would be endowed with what we regard as the attributes of humanity, the second with the signs of malevolence. Who would the viewer be led to feel sympathy for ? This would be Land & Freedom turned upside down: Stalinist as opposed to anti-Stalinist propaganda. What’s wrong with propaganda is not just that it tells lies. Propagandists also keep people passive: they pretend to give us food for thought, but deliver processed pre-digested stuff. Advertising and propaganda have a lot in common. Though propaganda often looks poor and crude compared to the imaginative skills of advertising spots, propagandists use similar techniques. A TV commercial links the product it promotes with the picture of something the prospective buyer is known to like: a car will be shown together with a happy family, pet-food with a playful kitten, a body lotion with a fashion model, etc. It functions on the principle of emotional manipulation. Likewise, propaganda gives a positive sign to what it wants us to believe, and a negative sign to what it wants us to reject. This is what the militia/regular army opposition boils down to in Land & Freedom: a confrontation between good guys and bad guys. Z (1969): in an unspecified country (that everybody understands to be Greece), an obstinate judge sheds light on the assassination of a left-wing MP by government and army officials. The Confession (1970): in 1952, a Czech government minister is arrested on false charges and forced to confess. Both were directed by Costa-Gavras and inspired by real events (in The Confession, the Slansky show trial later narrated by Artur London). Both were highly commercial and critical successes. One targeted fascists, the other Stalinists. Now, what light is shed by those well-meaning movies on the Greek colonels’ dictatorship, 1967-74, or on bureaucratic regimes in Eastern Europe ? Little or none, since historical explanation is reduced to a struggle between heroes and villains. The reader might object that Ken Loach is miles away from mainstream fashionable Costa-Gavras: isn’t his cinema guided by class perspectives ? True, but there’s more to it than class analysis. The ideas that underlie a film, and even more so the political point it wishes to make, only exist with regard to the way its writer and director show them to us. Whenever art is concerned, form matters as much as content. To fully grasp the historical significance of Dickens or Zola, one cannot be content with understanding their underlying or explicit “ideologies”: we also have to inquire into the way popular authors manage to build up the reader’s support and approval. How do they relate to the reader ? How much do they allow him to situate himself in his reading ? In fact, writers like Dickens and Zola used codes and patterns that left very little space for reflective and critical distance. What is true of books applies even more to films: because the cinema appeals more directly to feelings and emotions than most other art forms, its manipulative capacity is greater. Land & Freedom makes full use of this capacity. To get his message over to the audience, Ken Loach sends the right signals. He is careful not to present us with a character that has understood everything from the beginning. David goes to Spain as a dedicated but credulous anti-fascist, with an ingenuous belief in Soviet Russia and the CPs. He is what millions of workers the world over used to be, as naïve perhaps as the average spectator of the film. Only step by step, despite himself and through painful experiences, including the loss of the woman he loves, will he realize the truth that we in the audience gradually grasp thanks to him. Spain will have been a land of initiation for David at the same time as for us. The snag is, our awareness does not come from sorting out different options. Because everything makes us identify with David, with his successive attitudes, doubts and final certainties, we are left with one and only one alternative course of thinking. Besides, as in many other movies, the empathy process is at its most effective when we can identify with an individual who is far from an action hero, who looks and acts like you or me. The anti-hero has become the commonplace figure of the hero in our time, for those who prefer Ken Loach to George Lucas, that is. The argument is flawed, for a number of reasons. First, making the May 37 events public has a very different significance in 1937 and 70 years later. Orwell, whose experience in Spain was not dissimilar from David’s, had the utmost difficulty to get Homage to Catalonia published. Not all 1.500 copies printed in 1938 had been sold when a second edition came out in 1951. When Orwell died in 1950, there had only been one translation (in Italian). The American edition only appeared in 1952, the French translation in 1955. Since then, the book has become part of the cultural background of most Western politically-concerned or educated persons. Not the average moviegoer, but the usual Ken Loach viewer has heard of the “internecine” or “fratricidal” fighting between communists and anarchists during the Spanish civil war. It is doubtful Land & Freedom will enlighten him much. He is shown dispute and conflict between protagonists who remain obscure. POUM, CNT, Trotskyists, communists… what does all that stand for ? And what difference – if any - is to be made between communists and Stalinists ? All the viewer will remember is that the losers (POUM and anarchists) were probably right but it was not enough for them to get the upper hand, whereas the Stalinists won... until Franco won the war. Fortunately history has turned the page: totalitarianism is over, in its fascist as well as in its Stalinist variants. Franco is dead and so is the USSR. (Once again, as for the difference between communism and Stalinism, we are not any wiser: Stalinism is simply shown as a mixture of authoritarianism, militarism, outright deceit and lying.) Street fighting scenes in Barcelona, May 37, will not tell us any more. Secondly, what could we understand by identifying with one form of Good against one form of Evil ? If we take our lesson seriously, we should prepare to go to fight (i.e. to go to war) against any enemy likely to be painted as the absolute villain of the piece, against whom any means, however usually unacceptable like torture and extra-judicial killing, would appear as a lesser evil. When dealing with those who blow up innocent people in the subway, anything is deemed permitted. (“A terrorist is someone who has a bomb, but does not have an air force”, William Blum wrote.) Ken Loach himself certainly does not approve of the “war on terror”, but the binary good/bad logic of Land & Freedom is compatible with any version of lesser evilism. Basically, for the Communist Left (mainly the “Italian” Left, yet also the “German-Dutch” Left), from the moment the proletarians accepted to combat fascism under the leadership of the democratic State, they were doomed to failure on both counts: first they would lose the hard-won social gains they had achieved against the bourgeois, and later they would lose the anti-fascist military battle. The Communist Left’s political stand was (and remains) that of an ultra-minority. However, if one does not take this stand, if one believes Franco can only be defeated by an effective armed force, backed by all democratic sections of the population, including the bourgeois on condition that they fight fascism, who’s right then ? The small POUM militia whose only strength derives from its proletarian experience and insurgent activity ? Or a strong structured military machine, popular and modern at the same time, which does not mind making use of discipline, nor of conservative officers providing they firmly side with the Republic against Franco ? Land & Freedom does not make a stand on that issue, in fact it does not make any stand, it merely makes us feel empathy for the common people versus the powerful. Fine, but that hardly enhances our awareness. A democratic army is not what we are aiming at. Besides, the militias were certainly not as “primitive” as Orwell suggests. Whatever the case, Ken Loach’s film neither agrees nor disagrees. It dodges the issue. The problem with Land & Freedom is that it leaves us with the impression that despite the conditions of the time (i.e. 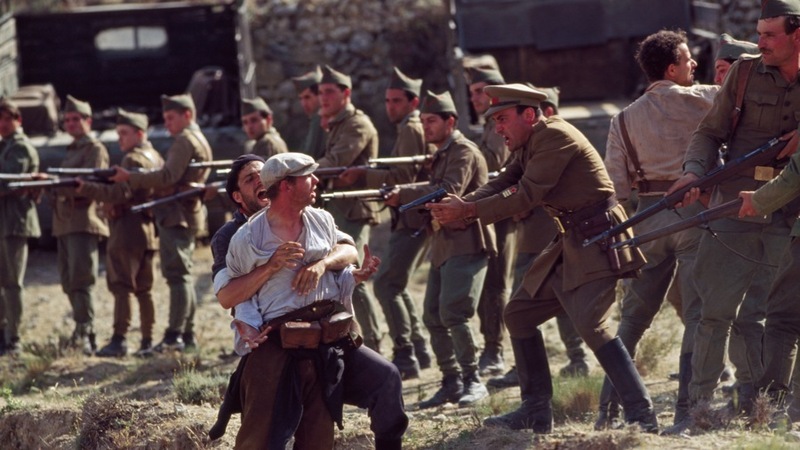 with a bourgeois State holding power), militias like the one portrayed in the film could have carried the day against Franco. Land & Freedom is not objectionable because it is a film with a message; but because it pretends to educate while it entertains with ready-made truths. Its narrative thread is not that different from a typical Hollywood production with its good folks, its wicked ones, its honest guy who is initiated into adulthood, loses innocence and goes astray before finding the right path. All these well marked-out characteristics of mainstream fiction are to be found in Land & Freedom, not forgetting the nice-looking clever girl who dies for the hero: Blanca’s tragic death is the final step in David’s breaking with Stalinism. The film does our thinking for us. We are shown a positive hero who sets an example for our behaviour. David learnt his lesson the hard way in 1937: the narration of his gradual awareness, the dropping of illusions about the CP, will instruct us 60 or 80 years later. Everything is seen through David’s eyes: any other possible window on reality remains closed to us. David faces a succession of choices which are in fact imposed upon him, and we are bound to subscribe to his (forced) decisions because each member of the audience is driven to identify with him. Actually, that is exactly the purpose of focusing everything on a positive hero (a reluctant viewer would have to reject the film as a whole, as a die-hard Stalinist might do, but they are a dying species). Instead of taking control of his understanding, the viewer is encouraged to remain passive. Autonomy – both individual and collective - is certainly not the key to everything, but it is a necessary condition of a consistent fight for human emancipation. Therefore there can be no “useful” propagandist activity. Self-empowerment is incompatible with emote control, positive heroes, role models and mapped-out conclusions. Nothing is obvious. Alienation will not be done away with by alienated means. Taken from the Troploin website. I thought ‘Land And Freedom’ a pretty good film, though it’s often over rated by politicos. This review is interesting and only a couple of things stuck in my craw. My memory is that Blanca – ‘an ardent and able defender of the POUM’, wears a red and black bandanna, which does not denote her as a member of the POUM. This may appear trivial, only the review states the importance of meaning through presentation. There is an intellectual arrogance in the assumption that an audience is simply left passive. Since Gilles Dauve was moved to write a review he was obviously not referring to himself. However, my understanding of what my friends and acquaintances think is a bit more complex than simply observing their behaviour.